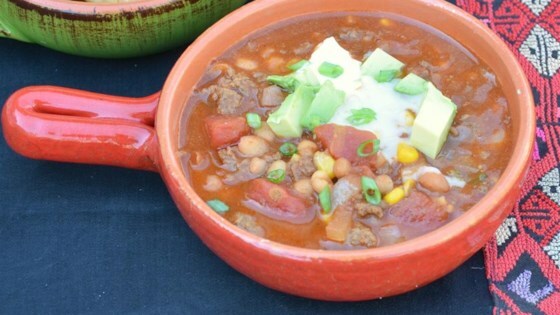 "Kid-friendly and easy to throw in the slow cooker on a busy day! Top with tortilla chips, cheese, and sour cream." Stir browned ground beef, tomatoes, kidney beans, pinto beans, corn, taco seasoning, and ranch dressing mix together in the crock of a slow cooker. Cook on Low for at least 3 hours. We love it. My grandson adds sour cream and crushed tortilla chips and shredded cheddar cheese on top of his and sometimes I join in with a spoonful of salsa. i let it simmer all day. It is delicious and quick and easy. Awesome on a cold winter day. I make this all the time....wonderful recipe. However, I have never used the ranch dressing and I will try it the next time I make Taco Soup to see how the flavor goes!